One of the last jobs to do when reworking or repairing a vintage Mixmaster, or after replacing its governor resistor, is setting its speed adjustment. This is set with the mixer set to speed #1 on its dial. You'll find a tiny hole in the dial on most models, designed to line up with the speed adjustment screw when the dial's set to #1. This allows a tiny Allen wrench (1/16" on models 3-12, 5/64" on 70's mixers) to reach in to turn the adjustable-length screw or pin that determines when the governor contacts open. In some of the earlier models, particularly the model 12, the Sunbeam medallion covers this hole, and will have to be pried off using a sharp knife. 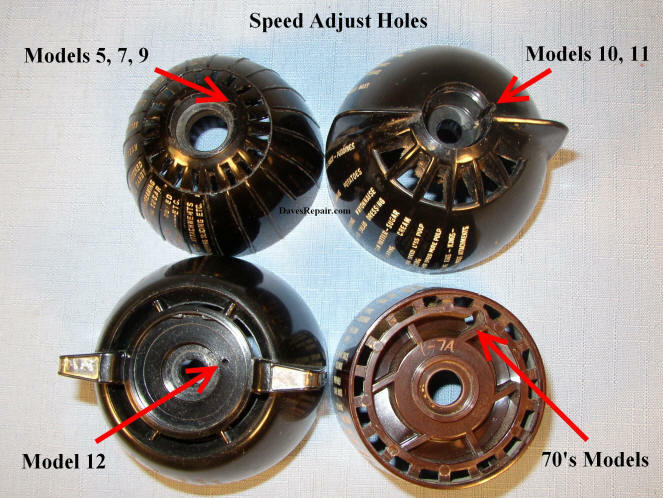 In 70's mixers, the knob is pried off the center of the dial to get to the adjustment hole. That can be a bit tricky to do without snapping the knob's two somewhat fragile retainers. To remove the knob, carefully insert a pin or small eyeglasses screwdriver alongside the chrome knob's hooks, at about 11:00 and 5:00, to release the hooks and pry it off. Proceed slowly and gently; as the hooks are extremely brittle and easily broken off. Once the hole is visible, with the mixer unplugged, insert the correct size Allen wrench and "feel" for the screw. Turning the knob back and forth a bit helps to locate it. Once the wrench is engaged with the screw, leave it there, and plug the mixer in. Turn the screw slightly one way, then the other, to get a feel for how the adjustment works. Then unplug it again. I don't like to run one on speed #1 for an extended length of time, as they generate a lot of heat. But they're engineered to handle that, so I'm just being overly cautious, I guess. The setting we're after on speed #1 is 200-300 rpm. Once that's set, if the rest of the mixer is in good condition, the other speeds will be correct, by design. If, after setting this, the speed doesn't vary fairly evenly from one end of the dial to the other, there's another problem with the mixer - binding spindles, etc. I use an old hand-held mechanical tachometer that I've modified for quickly setting this, and it works really well, but it's not absolutely necessary. Back in the day, before I had the tachs, I simply put a piece of black tape on one beater blade, then counted how many times/second it went around on speed #1. 4 revolutions per second will get one close enough - it doesn't have to be exact. I was always surprised by how close you can get one this way, though. After you set a few, you can get them really close "by ear", too. Once that's set, remove the Allen wrench, run it up to high speed and back a few times, snap the medallion/knob back on if applicable, and you're done! For downloadable service manuals for your Sunbeam, visit this page.